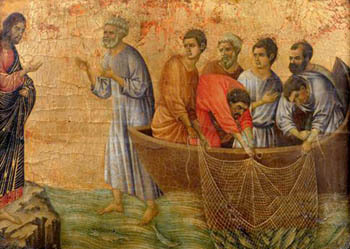 In looking at the readings for today’s liturgy, I am struck by their beauty and simplicity. The reading of those words themselves would serve for more than sufficient reflection. Could we, on this first Sunday of Easter, sit back and reflect on the times we have touched the lives of people and allowed God to open the door of faith for someone? Perhaps it was a child, a spouse, a grandchild, a stranger or a friend. In Revelations, John proclaims a new heaven and a new earth. He describes the voice from the throne saying, “See, the home of God is among humans. He will dwell with them as their God; they will be his people, and God Himself will be with them…” He continues with the words, “Behold, I make all things new.” What is the NEW that you are seeing God make? What NEW would you like to see God make? How can you help? Today’s Gospel takes us back to the Last Supper–that intimate meal with Jesus. Again, we hear Jesus’ oft repeated words, “Love one another as I have loved you. This is how all will know that you are my disciples…” As we reflect on the above words of Scripture, may we experience the love God has for each of us. Graciously be present to your people, we pray, O God, and lead all of us to pass from former ways to newness of life. Through Christ our Lord. Amen. It is hard not to notice dandelions. They love to pop up and multiply all over the place. No one plants them. Mowed down, they just reappear in greater numbers. Even when the plants are dug up by the roots, any tiny bit of root left will regenerate into these early spring flowers. Spring flowers yes, but they endure even to the winter. Moreover, in the summer and fall they provide children with delightful blowing of their seeds from the frothy head that remains after the yellow has faded. Yesterday, as I left the grocers by a different road, I came upon a rather small triangular plot of ground. In the center of the plot was a small but brilliant red fire plug. The dandelions in that plot of ground were given free access to as much of the land as they wanted and they had really taken over. It was almost as if they were trying to out-do the bright color of the fireplug. It occurred to me that the purpose of that fireplug was two-fold. First, it was to put out a fire, and second to be readily accessible when needed. It was limited in that it human hands needed to activate the power it held. Its usefulness was to be able to be available in an emergency. Perhaps when the weather was extremely hot the street children might be given a wonderful playground of splashing water. The dandelions, however, seemed to have no purpose except to be bright and beautiful. No purpose! What could be more important to a dandelion than to do exactly what God had destined for it! And we humans were not needed for that. They give glory to God by being, and just try to stop them from doing that. It is almost an impossible task. Well, what are we? Are we fireplugs, waiting for someone to release the power we have? On the other hand, are we dandelions, doing what God has destined for us, and not relying on someone else to release our hidden powers? I believe we are dandelions at times, and fireplugs at another. With God’s help, we can strengthen our “dandelion” selves so we do not need to lean too much on others to set the wonders inside us free. They’re here, they’re there, they’re everywhere. Those lovely, tiny wildflowers in our lawns, on the hillsides everywhere, pop up as soon as a bit of warmth comes to the earth after the cold dark days of winter. We scarcely notice them they are so small. Their five white petals have delicate lavender stripes that radiate out from the core of tiny green sepals and pale yellow pollen catchers. In clusters, these shy little flowers almost look like snow left over from the winter. As I pass by in my scooter, I stop just to be amazed at how much detail is involved here and how inexhaustible is God’s care of this lovely world we have been inhabiting. The Spring Beauties pop up even though no one has planted them or cared for them. Soon the mowers will come and they will be swallowed up like mulch. But they will have made their mark. During the early spring, weather changes very often. Spring tries to come and at the same time, the winter fights to stay. When I first saw this year’s spring beauties, the very warm weather caused a huge number on our lawns. Two days later the temperature dropped and the heads of these little treasures closed and dropped like a nodding baby’s. I was so concerned that they were finished for the season because of the cold weather. But three days later , they were upright and proudly holding court for anyone who wanted to see. So, what do they have to say to us? The fact that they came without pomp and circumstance, and seemingly had no audience, should help us when we think no one notices what we are doing. Or perhaps , no one cares. The beauties do the job they were created for, and we can do no more. Recognition is lovely, but not needed. Notice also that these sweet sisters of ours folded up their heads during the tough cold. That folding up helps to insulate us from what is hurting us. When things are hard for us, folding up our disappointments and using the protection of prayer and service, we can emerge to do what we were created to do. Spring is so lovely. So many things can speak to us of the wonderful gifts of God. I like little things. You may like grandeur. If so try the trees. Watch them come back from death to life! Peace and joy as the world comes alive again! Today’s scriptures are filled with so many different scenes. In the first reading we see Paul and Barnabas giving witness to the teachings of Jesus. The reading ends with the expulsion of Paul and Barnabas from the territory. Then, Revelation tells us that the Lamb will shepherd the people. The Gospel is a beautiful picture of a shepherd and his sheep. This brings to my mind the times I saw a Kenyan native shepherd simply standing or sitting near his herd of sheep, just watching. He carried no supplies with him because his total task was to tend the sheep. On the reservation I witnessed the same thing as I would drive down rough and dusty roads to my destination. Many times an Indian woman, man, or child could be seen with a herd of sheep and they would follow her or him wherever she walked. They knew their leader. They listened to his or her voice. I often thought what a wonderful reminder it was of our God and us. A God who loves us and leads us where we sometimes do not want to go yet waits on us with divine patience. God, our Loving Shepherd, teach us to constantly listen to You as You call us daily, lead us without fear, and invite us to be faithful to You and Your promise of eternal reward. Do not let us stray from Your sight and do not lose sight of us when we stray. Open our ears to hear Your call with an open heart and a willing spirit because You want only good for us. Teach us to constantly answer Your call and continue on the way to our eternal reward with joy and anticipation of what is to come. Amen. When I began this reflection, I thought I would find a special font to print Pope Francis’ name. Something elegant, and a bit fancy like Algerian, or Kunsler Script, or Showcard Gothic. But just look at him. He warrants a plain type. No fancy parts, no showy flourishes, just down-to-earth simplicity, the kind of simplicity that we know and admire in his chosen patron, Saint Francis of Assisi. Therefore, I used this simple font. Pictures of Pope Francis in the media show him embracing handicapped persons, washing the feet of inmates, kissing the feet of babies after Baptism, removing his skullcap when the wind threatened to whisk it away. These are not what we have come to associate with the papacy. And I wonder, “Why not?” What kept this following of the poor and humble Jesus hidden in the papacy? As one woman put it, “He has made history in just three days!” And what a history he is unfolding. I can hardly wait to follow him when he opens again the documents of Vatican II and puts the spin of Franciscanism on them. I believe that this man of Italian heritage and born in Argentina will capture the entire world with his humility, genuine love of humanity, and determination to bypass the trappings of richness. We will see nothing in him that puts him above us. He still rides the bus, pays his own way, and carries his own luggage. I have been a vowed Franciscan for more than 60 years, and fell in love with Francis at about age seven. My goal then was to be a person like St. Francis. I see Pope Francis, and I am aware of how far I am from following the poor man of Assisi, and ultimately the poor Jesus. I hope to rectify that as I watch the successor of St. Peter putting me to shame. 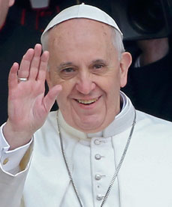 If we let him, Pope Francis will be able to bring about a true reform in the church and in me. The apostles in the early church laid hands on the sick and cured them. By these signs and wonders, many came to believe in Jesus. 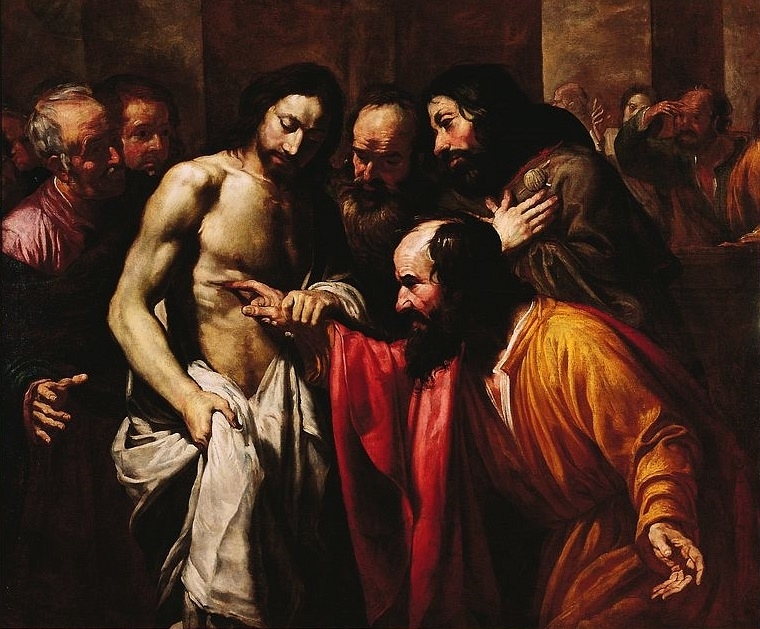 In today’s Gospel, we have the apostle, Thomas, who refuses to believe in the Risen Lord unless he can see and touch His wounds. How difficult it can be for us today to have faith Jesus, whom we have not seen in the flesh, and whose power to work miracles we may not have witnessed. Do we sometimes doubt, as Thomas did? Through today’s readings, however, it appears that Jesus is well aware of our weaknesses and limitations. This is evident when He says: “Blest are those who have not seen, yet still believe.” (Jn 20:29) Jesus further reassures us in Revelations that He is the first and last, and that we should not be afraid. How much faith in God do we really have? Dear Jesus, help us in our unbelief and doubt. Help us to have faith in You and Your promise of eternal life. Strengthen us so that we will know and believe, on the deepest level, that you are the living Son of God who lives forevermore. Help us to persevere in faith, hope, and love until you call us home to be with you in the fullness of your presence forever. Amen.